It appears a division has taken place among connoisseurs of the Nordic crime genre. There are those who prefer action packed rocket rides, as exemplified by Jo Nesbø, and those who prefer simple, quiet novels, where little happens and atmosphere supersedes plot. If you’re among the latter, Münster’s Case is for you. It moves slowly—and I mean sloooowly. The crime: In the fictional city of Maardam, in a Scandinavian country never revealed, four elderly men meet regularly to socialize, drink, and gamble. They play the lottery. A winning ticket nets them 20,000 guilders to share. They go out to celebrate and drink more than usual. In the wee hours of the morning, one of the winners is stabbed to death in his bed. Another of the fortunate four disappears. The slow pace of the book is exemplified by the fact that it’s only about a quarter of the way through the novel that an entire team of investigators, putting their heads together, realize the killer might be one of the other four winners doing away with his partners to increase his share of the winnings. Now our literary troubles begin. Standard run-of-the-mill police procedures don’t take place. If common death investigation techniques had been employed, it would have been a short book indeed, leaving the case would have been open and shut. One would assume Mr. Nesser, a veteran crime writer, knows police procedure very well, so it seems he has ignored it at times—and such failures occur throughout the novel—for the sake of carrying the plot forward. The novel suffers other flaws. Instances of loose and/or choppy writing. Similar and as such unnecessary character traits in various of those in Mr. Nesser’s cast. The character set is on the large side, and almost all are point of view characters. Most of the dialogue is internal, and a lack of identification often leaves uncertainty about who is thinking. These problems may not be Mr. Nesser’s fault, but mistakes by translators and copyeditors. Let’s hope so. Münster is filling in for Inspector Van Veeteren, who hasn’t retired, but has gone on what seems a permanent leave of absence. We learn little about Münster throughout the novel other than he’s concerned about the fate of his marriage—and this is repeated many, many times. There is much repetition throughout the book. Suspects and potential witnesses are interviewed again and again, despite having rather obviously little or nothing to contribute to the case, after which the investigators discuss their frustration due to lack of progress. This pattern is often frustrating to the reader as well. Because Münster’s inner world is never deeply delved into, the novel doesn’t work as a standalone. Indeed, the scenes that shine the brightest are when Van Veeteren appears in sporadic cameo appearances. 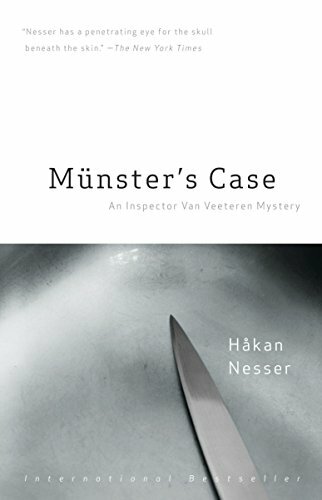 Håkan Nesser is a fine writer; however, in the final analysis, Münster’s Case is just not one of his better efforts.